In France it was easy to fall asleep and wake up with the sun. It was just the right time of year that the night hours made for convenient sleeping hours, and I rather liked it that way. It was a bit harder to do that in Scotland - the nights were already on the short side, about five or six hours, so I'd often fall asleep in light and the sun got up well before I did. The night was quite chilly at Portree. I'd brought my light sleeping bag, which was fine but I had to wear warm stuff inside it too and make the most of the hood and drawstrings. I woke at 7:30 and left at 9, pleased to find that at I hadn't got any slower at getting away in the morning. I was pleased to find that the BBC's "two raindrops" forecast for Tuesday was a pack of lies, and the day was pleasantly sunny, a blue sky with only a few puffy white clouds. 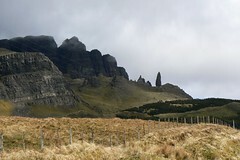 I carried on up the road and onto the Trotternish Peninsula, which is characterized by a huge ancient landslip running most of its length. The traffic and I parted ways at this point, and the road turned single track. Sheep wandered everywhere. As animals go, sheep are quite cyclist-friendly, despite being a bit annoying if you get stuck behind one. Unlike dogs, horses and cattle I've never had a sheep try to "take me on" by rearing up, chasing or charging. They seem to be universally terrified of the bicycle in a non-aggressive way, even if they will jog half a mile while frantically dashing themselves against the nearest fence in order to prove it. 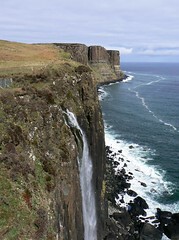 I passed the Old Man of Storr, a tall needle-like rock on the landslip, and Kilt Rock, a cliff with a tartan-like pattern marked out by rock strata, with its nearby waterfall. I don't think I'd ever seen a "proper" waterfall before. The terrain was quite tough, a lot of ups and downs, and my legs were still getting used to carrying a full load again, but there were plenty of interesting, rocky and beautiful landscapes and things were made easier by the lovely weather. I dropped down a series of sharp hairpin bends into Uig, having revised my original route quite considerably and planning on getting the ferry to Tarbert the next day. I spent the night on a mostly empty campsite with lovely views across the water, the rocky outline of the Outer Hebrides visible on the horizon. Waterfalls never cease to be fascinating; whether small, large (biggest in UK is in Yorkshire Dales iirc), or huge (eg. niagara - an awesome sight, especially from the 'maid of the mist' boat ride).